Pots, pans, skillets, and bakeware come in many materials. Copper pans and aluminum are the best heat conductors. Copper pans are more expensive and tarnish, but they are easy to clean following the guidelines here. That’s where glass cookware brands come in for even heat in the oven and being easy to clean. Glass is a poor heat conductor yet it distributes heat more evenly and that’s why I love it. It’s convenient, easy to clean, and bakes evenly every time. Once hot, it stays hot longer than other metal cookware. The lovely glass bakeware sets for casseroles go directly to the dinner table placed on a hot plate or trivet. If you roast or bake chicken in the oven, be sure you can use it on your stove top after it’s done for gravy. If not recommended to use on your stove top, make your gravy in a metal skillet. 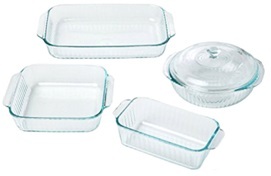 Glass bakeware is excellent for casseroles, cakes, pies, and other braised meats. Glass cookware should not be used under the broiler unless the manufacturer says you can. The heat is so hot it can crack and break even to explode glass. If the manufacturer does not state you can use their cookware on stove top burners, don’t use them there. Glass is free of chemicals with no BPA since it has no plastic in it. It’s recyclable and ecological for the environment. It’s healthy to use and I have much of it in my kitchen. Baking dishes made of glass is safe for all foods, does not react with acid foods such as tomatoes and it will not absorb anything. Nothing leaches from glass into your foods. It’s easy to clean and most go into the dishwasher. Glass does not absorb food flavors or odors. It’s a one-dish method for cooking and can be stored in the refrigerator to warm up in the microwave. Some can be stored in the freezer. The main drawback to glass bakeware and cookware is its low fracture hardiness. It does not like sudden temperature changes that can cause it to fracture and break. That’s why it’s important to leave the frozen dish on the countertop until it’s at room temperature to heat up again. Pyrex® and Anchor Hocking® make the best glass and have been making it up to today for 60-years. Never put a hot dish or lid into cold water. Let it cool to room temperature before washing it or putting into the dishwasher. The extreme temperature change can cause the glass to contract or expand resulting in breaking. Watch this short video about glass bakeware vs. metal. Please read my glass pots and pans review below for the best to buy. Glass bakeware vs. metal video. I think you will learn a lot about the ways to use glass when you have used metal most of the time for cooking. 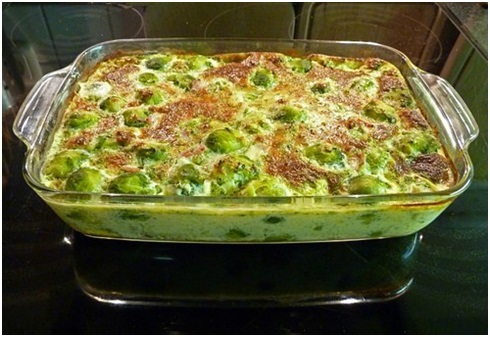 Brussel sprouts casserole not only looks good, it is good baked in glass. It is covered with bacon and cheese and goes straight from the oven to the table. The Libbey® brand makes glassware and tabletop items for your everyday celebrations. 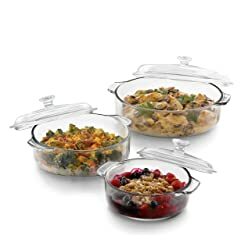 Model number 56030 on Amazon.com® is a best-selling set of covered glass casseroles with lids that you will enjoy as much as I do. These can be stored in the fridge and freezer with the lids on and then rewarmed in the microwave without a problem and they are dishwasher safe. These are the best for baking and roasting in glass bakeware sets. Make delicious creamy macaroni and cheese, baked chicken and meat, and deserts easily with this set. I make Jell-O® with fruit for my kids and it sets up beautifully with the lid on in the fridge then is gobbled up within a day! In the oven you can see all sides when baking. You can cook in the microwave as well. The size and dimensions are embossed on the handles. The glass is lead-free and cadmium-free. The maximum oven temperature is 425-degrees F.
Your set includes 1 each round (not oval) 1-quart-, 2-quart-, and 3.2-quart glass casseroles with lids for each one. The 3 sizes measure: small 6-3/4-inch diameter x 2-3/4-inches deep; medium 8-1/2 inches diameter x 3-inches deep; and the large is 10-inches diameter x 3-1/4-inches deep. Never use this glass bakeware set with lids on the cook stove top or under the broiler! They will crack and break from the extreme temperature. The casseroles can nest inside each other and the lids work best in a slide-out lid holder. Customer satisfaction is Libbey’s® goal. If you are not completely satisfied with your purchase, simply return the merchandise to the Toledo Libbey Factory Outlet location, 205 South Erie Street, Toledo, Ohio 43604, within 45-days of purchase, or contact them at [email protected], or 1-888-794-8469, notifying them and providing a reason for the return. These are made in Monterrey, Mexico. 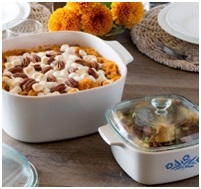 CorningWare™ has been making glassware since 1958 and is a superb cookware company. Their CorningWare™ Visions® Dutch oven item number 1055278 on Amazon.com® cooks on the stove top, in the oven, and microwave. The see-through glass lets you see what’s cooking at a glance. Cook on electric, gas, and not induction because there are no magnets on the bottom inside of the glass. This round 5-liter (5.2-quart) Dutch oven can be used as a serving dish and can be stored in the refrigerator and freezer. Two handles are on each side for easy lifting with a knob on top for the lid. 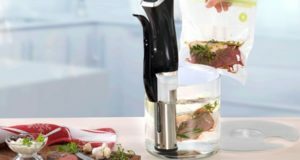 It is made of a non-porous glass-ceramic material that will not absorb food flavors or odors and will never leach with acid-based foods. It is total convenience to you being dishwasher safe, and able to be used in the refrigerator, freezer, microwave, oven, broiler, and stovetop. The temperature can go to 500-degrees F.
The outside dimensions are 12-5/8-inches diameter x 5-1/4-inches tall. The Dutch oven weighs 5-pounds and 15-ounces. The lid is 10-1/8-inches x 4-3/4-inches. You will receive instructions and a 10-year Limited Warranty. The pot is made in France and the lid is made in China. CorningWare™ Visions® Glass Ceramic cookware video. Pyrex® has been a kitchen favorite in glassware for decades. I use their measuring cups and storage containers because they are glass. You will love these baking dishes as I do for meatloaf, homemade bread, and any other foods you want to bake. 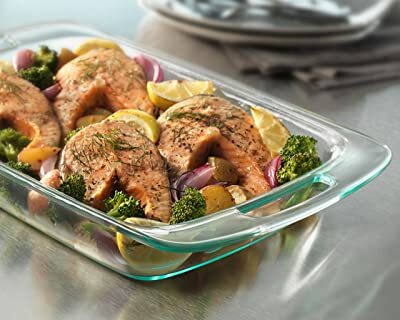 Glass bakeware sets Pyrex® is made out of heat-strengthened (tempered) soda lime glass for about 60 years. The glass and plastic lids are dishwasher safe. You cannot bake or cook with the lids on since they are plastic and will melt. You can use the lids in the microwave, but I don’t because I’m afraid the heat will change the shape; I use paper towels to cover the dishes. A variety of size pieces are available on Amazon.com® for what your family size needs up to 28-pieces. The Easy Grab® handles 5-piece bakeware set includes a 3-quart (9- x 13-inches) oblong baking dish with blue plastic lid; a 2-quart (7- x 11-inches) oblong dish; 2 each 8-inch square baking dishes, and a 1-1/2-quart (6- x 11-1/4-inches) loaf baking dish. Only 1 blue lid comes with the set. 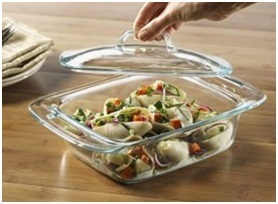 Your glass bakeware sets Pyrex® is dishwasher, refrigerator, microwave, and pre-heated oven safe. The plastic lid is BPA-free and is dishwasher safe on the top rack to be used in the fridge and microwave. The non-porous glass will not absorb flavors, food odors, or have any stains. The lids sit tightly on the glass for storing your leftovers. You will receive instructions and 2-year Limited Warranty on the Pyrex® glass and plastic lid. Pyrex® glass is proudly made in the USA. Pyrex® Easy Grab® Bakeware video. 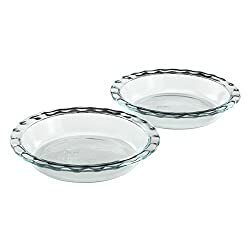 The Pyrex® Easy Grab® Pie Plate, 9.5-inches comes with 2 each plates for all your pies, quiches, and more. The fluted edges give you an edge on a crimped piecrust. It is a #1 best seller on Amazon.com® and is affordable for both of them. To not be confused, they have no handles. The easy grab simply means they are easy to grab under the fluted edges. Who makes only one pie at a time for their family? You can make freezer, cookie crumb or graham cracker crumb pies, no bake, or bake the traditional flour pie shells. These are dishwasher safe even on the lower rack. They can be kept in the fridge and used in the microwave and oven. Do not use pie plates on the stove top ever! They will shatter and break and could explode. There is never BPA in glass; glass is now lead-free everywhere. 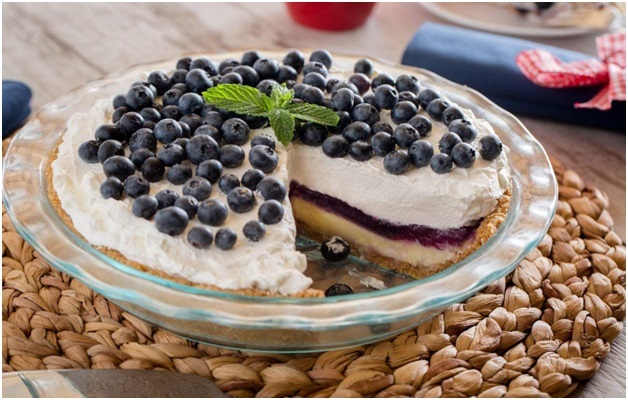 This blueberry cream pie looks absolutely delicious with a crumb crust and meringue on top. These won’t stain or absorb flavors and odors since they are made of glass. The outside dimensions are 11-1/4-inches diameter x 2-inches deep; the inner dimensions are 9-1/2-inches diameter x 1-3/4-inches deep. The volume is 56-ounces and the weight is 1.8-pounds. You will receive instructions and 2-year Limited Warranty on the Pyrex® glass pie plates. Pyrex® glass is proudly made in the USA. The Pyrex® Easy Grab® 9.5-inch pie plate review video. Emile Henry makes exquisite pie plates since 1850 in France. I selected this pie dish because it is deep for those chocolate pies and fruit pies you love. It makes good chicken pot pies too! 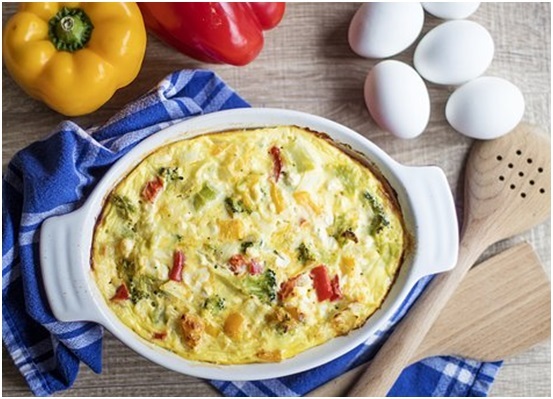 Use it for quiche, casseroles, serving vegetables, and more. 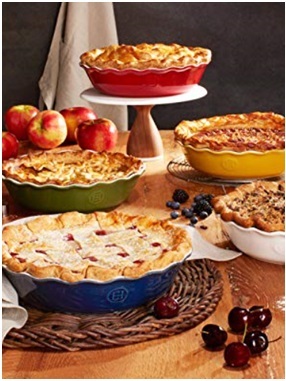 The pie plate is inexpensive made of high-fired burgundy clay using Emile Henry’s HR ceramic (high resistance) and it has even heat diffusion and heat retention. See the item model number 556121 on Amazon.com® in lovely colors to match or coordinate with your kitchen or dinner China. It is 10.25-inches in diameter x 2-inches deep. Use in the oven up to 520-degrees F., in the broiler, and microwave. Can go in the fridge or freezer then go to a hot oven to the table. No, it’s not non-stick; it’s ceramic with a hard glaze that won’t scratch or craze. Clean in the dishwasher or by hand with dish detergent and warm water. You will receive a 10-year Warranty against manufacturing defects when used in a household environment. The pie dish is made in France. Emile Henry Pie Dish Review – CHOW video. Anchor Hocking® Fire-King® has been around since 1942 and we who use this brand love it! The model 77889 is a Choice Amazon.com® baking dish with lid. This is ideal for a family of two. It is made with low-expansion borosilicate glass. Being clear, you can see what’s cooking and you can use the lid separately upside down. Make casseroles in the oven, delicious green bean casserole with mushroom soup and crispy onions on top, chicken dishes, egg bakes, apple crisp, reheat leftovers in the microwave, and store in the fridge. It is dishwasher safe even on the lower rack. It’s actually best to hand wash since over time, strong dishwasher detergent will make the glass lose its luster. Do not use on the stove top or under the broiler; the glass will crack and break. It measures 3-1/4-inches high x 7-5/8-inches wide (handle end to handle end) x 6-3/8-inches wide (sides without handles). The 20-ounce dish holds 2-cups 4-ounces. Gift-wrapping is available and anyone you give this to will love it and want more. It is made by Anchor Hocking® in Ohio, USA. Anchor Hocking® Fire-King® 77889 casserole baking dish with lid video. 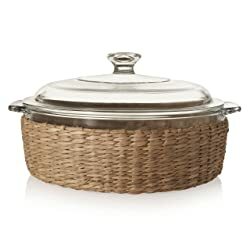 Libbey® makes the perfect 2-quart size, model 56978 on Amazon.com® with a basket for keeping the dish warm, and for a lovely decorative feature when taking to picnics, pot lucks, and gatherings. The sea grass basket insulates very well and keeps the glass dish inside flat. The basket cannot be put in the dishwasher, yet can be wiped down by hand. You will receive the lead-free glass casserole with glass lid and the basket. The 2 handles at the sides makes it easy to grasp and carry. The dish and cover are oven, microwave, refrigerator, and freezer safe. Do not use on the cook top or under the broiler. See your food cook but do not put the basket in the oven, microwave, fridge, or freezer. The dimensions are 9.02-inches diameter x 3.74-inches deep x 9.17-inches diameter with handles. It weighs 6-pounds. Customer satisfaction is Libbey’s® goal. If you are not completely satisfied with your purchase, simply return the merchandise to the Toledo Libbey Factory Outlet location, 205 South Erie Street, Toledo, Ohio 43604, within 45-days of purchase, or contact them at [email protected], or 1-888-794-8469, notifying them and providing a reason for the return. This casserole is made in Monterrey, Mexico. 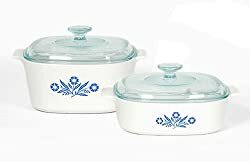 The CorningWare® Stovetop™ Pyroceram® new vintage Blue Cornflower glass ceramic casserole set is a Limited Edition and the best set ever! I’ve had this same 2-piece set for over 20-years, and it is just like the day I bought them. This is a CorningWare® glass collectible to pass to the next generation. The set came with handles when I bought it to lift on and off the stove. Yes, these are stove top safe for gas and electric cooktops, but not on induction because there are no magnets inside the cookware. Use in the toaster oven and microwave. Pyro relates to fire and ceram refers to ceramic therefore the name, Pyroceram®. It was developed in the 1950s by Corning® Inc. The item number A-423C-BF on Amazon.com® is a stovetop set from the past and still today. This set was made by Corning® in 1958. This set is durable, chip resistant and can be used in the oven, broiler, microwave, and stored in the refrigerator to rewarm again. 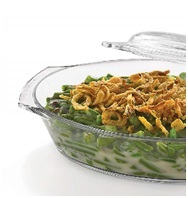 The set includes a 2.11-quart casserole with Pyrex® glass lid, and a 3.17-quart casserole with Pyrex® glass lid. Be sure to preheat your oven before putting the casserole dishes in. These are dishwasher safe, yet I wash mine by hand to maintain the bright blue cornflower colors. Being non-porous, the surface does not absorb food odors, flavors or stains. I do not use sharp knives to cut anything baked because it will make marks forever in the bottom. I use and highly recommend wood, rubber, or silicone spatulas or serving spoons for this cookware. Gift-wrapping is available for someone you know that loves this blue cornflower casserole set. 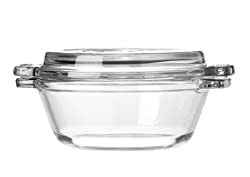 You will receive a 10-year Limited Warranty on Pyroceram® bakeware and a 2-year Limited Warranty on the Pyrex® glass lids. 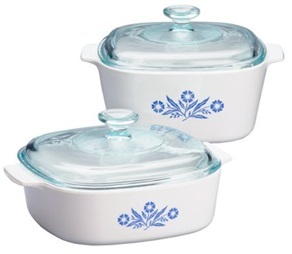 These are made in France and Corningware™ is located in New York, USA. CorningWare® Stovetop™ Pyroceram® Blue Cornflower Casserole, 4-Piece set review video. 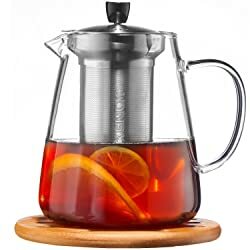 CUSINIUM is a relatively new company that makes this gorgeous and functional glass teapot with infuser for your loose-leaf tea. It works well without the infuser for tea bags. The glass teapot for stove makes perfect tea brewing whether you drink it hot, iced, or both. The item model number GT001950 is the Choice rating on Amazon.com®. The teapot strainer is for blooming and flowering and the sleeve is for warmer tea. 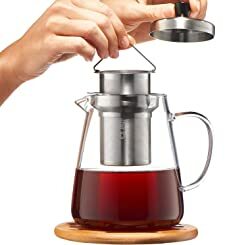 The 3 mm thick glass is borosilicate Pyrex® and can go into the microwave, but not with the stainless-steel infuser or lid, and the ring holding the filter. The design of the teapot allows you to remove all these parts easily. 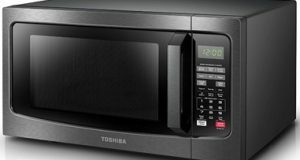 It is also not recommended to microwave the sleeve or the black outer cover. The glass teapot infuser is removable with the small handle on top of it so that you don’t over brew your tea. The infuser holes are 0.35 mm. The lid then goes back on and locks in place. You can use this to heat water too. The spout is spill-free pouring where you direct it so that it doesn’t spill your tea on your clothes, table cloths, furniture, countertop, or floor. The tempered glass teapot is dishwasher safe. The glass is lead-free and there are no plastic parts except the lid’s black knob that is made of polypropylene (PP) and has no BPA (bisphenol A). The teapot holds 2- to 4-small cups. The filter, the lid, and the ring that holds both are made of 304 (18/8) stainless steel. The pot stays hot for 3-hours with the outer cover on. The sleeve is made of Neoprene® that is washable and heat resistant. It can be washed at 30-degrees F. by hand and line dried. However, it is not recommended to wash Neoprene® in the washing machine or put in the clothes dryer. It wraps around the teapot and attaches to itself with Velcro®. Neoprene®, also polychloroprene (PC rubber) is a family of synthetic rubbers. It was invented by DuPont®. Gift-wrapping is available for the perfect gift for your tea loving family and friends. 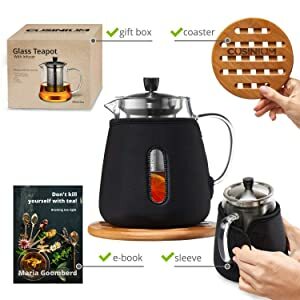 You will receive all of this: a gift box for gifting to someone; a bamboo coaster to sit the hot teapot on; a black outer see-through cover for the pot to keep your tea hot; and an E-book sent to your email address. The diameter of the coaster is 5.9-inches. The infuser has holes on the sides and bottom. The infuser dimensions are 2-1/16-inches x 3-3/4-inches high, with a 2-1/2-inch flange at the top. CUSINIUM offers a 100% risk-free satisfaction guarantee! It is made in China to FDA standards. Pyrex® of course makes these easy to grab large ergo handles for removing the lid and taking the casserole out of the oven. The Amazon.com® model number 1085801 is also available in a 2-pack for the 2-quart casseroles. These are affordable, will not warp or stain and never absorb food tastes and odors. 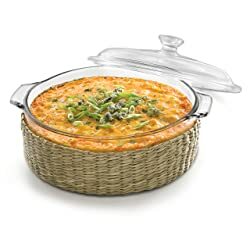 The gorgeous glass bakeware casserole with lid is durable and classic. Create delicious casseroles, meat loaf, chicken, beef, and fish in a beautiful looking dish that you can take right to the dinner table. Make no-knead bread or if you’re ambitious, make bread that you knead by hand and bake in the glass bakeware Pyrex®. Make cakes, brownies, pound cakes and cobblers in the dish with no problems. Put the lid on and store in the fridge or freezer. Make escalloped potatoes, macaroni and cheese, lasagna, and bake whole small vegetables. 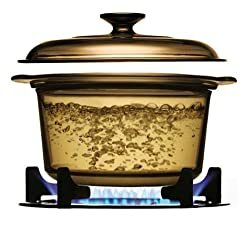 The maximum glassware temperature is 490-degrees F.
The outside of the casserole is 12-1/2-inches long x 8-1/8-inches wide x 3-inches high and the glass lid is 11.6-inches long x 8.1-inches wide x 1-inch high; assembled it’s 12-1/2-inches long x 8-1/8-inches wide x 3.5-inches high; and the inside is 9-inches wide x 7-1/8-long x 2-5/8-inches high. You will receive instructions and a 2-year Limited Warranty on the Pyrex® glass. Pyrex® glass is proudly made in the USA. First thing to do is to read the manufacturer’s User’s Manual or Instruction Booklet that comes with the product you bought. There is a lot of good information there for how to take care of your item. Also read the WARNING label on the item. Always wash your item before using the first time. 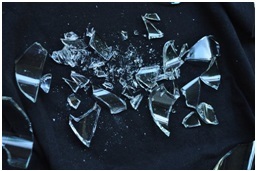 Don’t put hot glass cook or bakeware directly on a cold or wet surface that can cause the glass to crack and break. Never put into cool water or any water until it’s at room temperature. Sit the glass pots, pans, and bakeware on a towel, pot holder, or trivet. Don’t put glass bakeware immediately from the freezer to the oven; it can crack. Let it come to room temperature. Don’t put hot food in glass or any other container to the freezer or refrigerator until it is at room temperature. Not only can the glass break, but any hot food makes the refrigerator run longer to cool the food. 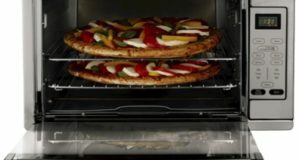 Let your oven preheat to the temperature it will bake at before putting in glass bakeware. This is good to do for metal pans as well to ensure baking accuracy. Don’t add hot or cold liquid to your glass cookware that will cause the glass to expand or contract and shatter, crack, and break possibly exploding. Cover the bottom of the glass cookware with the liquid you plan to use with your meat or veggies. If you need to add more liquid later, heat it on the stove top or in the microwave, then add. 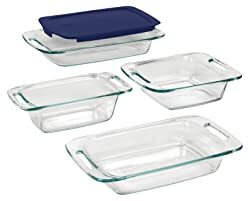 Glass bakeware should never be used in the oven hotter than 350-degrees F., unless it’s ceramic such as the CorningWare® Stovetop™ Pyroceram® Blue Cornflower Casserole reviewed above. Never ever use glass baking dishes on the stove top or directly under the hot broiler! These will break. Glass baking dishes are for oven use only. Throw out or recycle any glass bakeware that is cracked, chipped, or heavily scratched since these can possibly shatter. Don’t take risks with it because it can explode. The information above applies to glass teapots on the burner and anything made of glass. Know that today’s glass does not have lead in it. BPA (bisphenol A) is never in glass because that chemical is used in some plastics, never glass. Glass pots and pans cookware and glass ovenware are very safe to use with a little common sense. Even with metal pots and pans, you never want to add cold water to a hot pan that can warp the bottom to never be flat again. Glass ceramic cookware is a little more forgiving when adding hot or cold liquids later in the cooking process. Leave a question, comment, or idea in the comment box below for a quick reply to each one of you. Happy shopping! Glass Cookware Dangers from CBS News video.